CLEAN ENERGY FROM A LEAF, NOT A LAB | Our products are made with clean, organic ingredients - not packed with synthetic ingredients and sugar like traditional energy drinks formulated to jolt and jitter. RUNA's organic, single-source of natural caffeine comes from Guayusa, an Amazonian jungle super leaf. SUSTAINED ENERGY AND FOCUS - NO CRASH | Thanks to the guayusa leaf's unique balance of caffeine, polyphenols, and L-Theanine, RUNA energy drinks provide sustained energy, mental clarity, and focus - all without feeling the crash typically associated with other energy drinks. ORGANIC. NO JUNK. GOOD THINGS | We're dedicated to bringing you clean energy in every way possible, from using real ingredients, to how we source and produce our great-tasting energy drinks. That's why our drinks are certified USDA Organic, Fair Trade, Non-GMO, and Kosher. 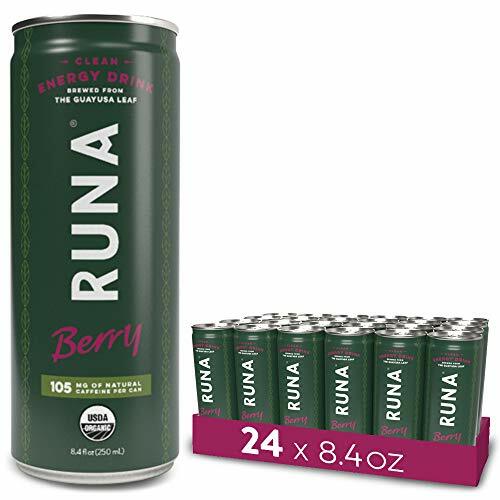 RUNA energy drinks are also gluten-free, paleo, and vegan. FEEL FULLY ALIVE | For thousands of years, the indigenous Kichwa people have woken up before dawn to gather around a communal fire and drink guayusa. During this early-morning ritual, community members share dreams, myths, and legends. They describe the effects of guayusa as making them feel "RUNA", which translates to "fully alive". BETTER FOR THE WORLD | Being Fair Trade Certified means that a fair price is paid to our farmers and a safe work environment ensured for all workers. It's all part of what makes us a Certified B-Corporation. This means that we have defined goals to have a positive impact on society, workers, the community and the environment. Final Price as low as $32.48 Shipped!